SYNOPSIS: In the great tradition of child fantasy stories such as The Wizard of Oz and Alice in Wonderland, Terry Gilliam takes us on a wild adventure with his adaptation of Mitch Cullin’s cult classic novel. Welcome to the world of Jeliza-Rose, the young heroine and narrator of TIDELAND. What has brought Jeliza-Rose from the big city to the prairies? And why is her former rockabilly guitarist father not talking to her anymore? And who is making all that noise in the attic? Jeliza-Rose drifts from the harsh reality of her childhood and escapes into the fantasies of her own active imagination. This is a fantasy world to rival all others; here fireflies have names, bog-men awaken at dusk, monster sharks swim down railroad tracks, and disembodied Barbie heads share in her adventures. 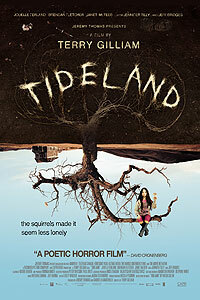 TIDELAND is as optimistic as it is surreal, as humorous as it is suspenseful – a celebration of the power of a child’s imagination.